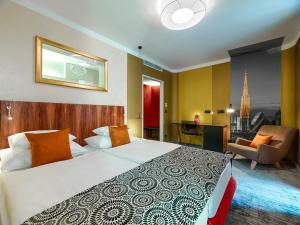 Enjoying a prime location in Vienna's centre, this life&style hotel at the Schwedenplatz metro hub is an 8-minute walk away from St. Stephen's Cathedral. It offers soundproofed rooms with free Wi-Fi. All stylish and colorful rooms at the Hotel Capricorno are air-conditioned and come equipped with a Sky satellite TV, a tablet with free WiFi, a minibar and a safe. Restaurants and pubs can be found in the immediate surroundings. Here you can experience vibrant Vienna in the heart of the city. The stop of the U1 and U4 metro lines is just 100 metres away from the Capricorno hotel. Also numerous tram lines pass the Schwedenplatz stop. These include the yellow sightseeing tram going around the famous Ring boulevard.